Again, just track all the tweets and blogs to know what happens in Camp KDE in almost real-time. For more pictures, check out KDE Events Pool at Flickr. 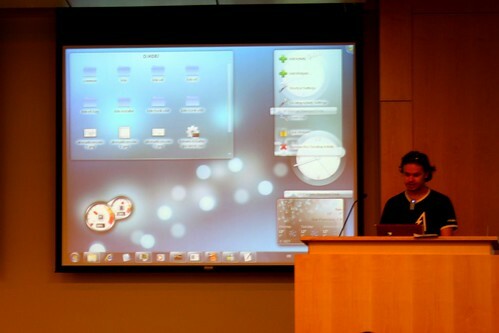 In one of the talks today, Romain "Frankenstein" Pokrzywka showcased KDE 4 on Windows. Though he blogged about it recently, it is definitely interesting to see a live demo, especially things like Plasma running (and crashing, occasionally) on Windows, and that some apps are really usable already. Well, who knows? In the not so distant future, it is definitely easier to convince Window users like Joe Sixpack to start using KDE apps.